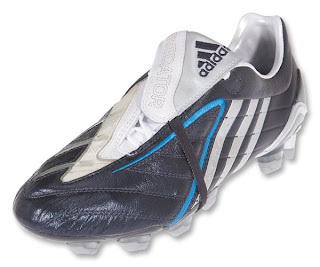 The Predator Swerve is the latest major incarnation of the iconic and hugely popular Predator soccer boot. But most importantly, it features more technology than ever before! So, there’s no doubt this new Predator will be hunting prominently across the globe in international soccer competitions and all the top divisions, right down to the grass roots. The introduction of SmartFoam technology (adapts to offer increased power and/or shock absorption on ball strike as your needs change throughout the match) and a re-designed PowerPulse system gives this boot increased ball spin for accuracy and masses of power when you need it. Liquid Predator vamps have been added to produce extra swerve on the ball. With the launch of the Predator® Swerve - adidas is adding an exciting new chapter to the successful Predator® story. Since first being introduced in 1994, the Predator® has been continuously further developed with the help of top soccer players, guaranteeing that it meets the highest standards in terms of design and, above all, functionality. World-renowned soccer stars relying on the new Predator® technology include: David Beckham (LA Galaxy, AC Milan), Michael Ballack (Cheslea FC), Liverpool’s Steven Gerrard Daniel Agger, and Dirk Kuyt, Patrick Vieira (Inter Milan), Marc Janko (Red Bull Salzburg), Angelos Charisteas (1. FC Nuremberg), Daniele de Rossi (AS Roma), Tranquillo Barnetta (Bayer 04 Leverkusen) and Anderson (Manchester United). While we may not be the first to have these, we are always on the top in the US market. In the future we will be offering launch dates for the top items all soccer fans want.